Television Critics Association Press Tour, Pasadena, CA, January 19, 2016 – Today, PBS KIDS debuted full-length streaming video content and digital games from its newest multiplatform media property READY JET GO!, an animated series that will help children learn astronomy and Earth science concepts. On digital platforms, viewers can now preview four full-length 11-minute stories from the series. The episodes will continue to roll out throughout the month, totaling 12 11-minute stories by January 29, the most full-length video content PBS KIDS has ever released in advance of a broadcast premiere. The videos are available for free on pbskids.org, the PBS KIDS Video App and PBS KIDS Video on Roku, Apple TV, Amazon Fire TV, Android TV, Xbox One and Chromecast. In addition, two mobile-friendly web games, hands-on activities for children and families and a live stream of the International Space Station channel are available at pbskids.org/readyjetgo. READY JET GO! premieres on-air Monday, February 15, on PBS stations nationwide (check local listings). Created by Craig Bartlett (DINOSAUR TRAIN), READY JET GO! is designed for kids ages 3-8, with a focus on astronomy, technology, scientific exploration, innovation and invention. READY JET GO! follows Jet Propulsion, a new kid in town who also happens to be an alien from outer space. With his Earth Friends Sean and Sydney, Jet goes on astronomical adventures exploring the solar system and how it affects our planet, while learning about friendship and teamwork along the way. READY JET GO! features live-action interstitials with Jet Propulsion Laboratory astrophysicist Dr. Amy Mainzer, who is also a science curriculum consultant for the series. The overarching goal of READY JET GO! is to spark children’s inherent excitement about science, technology and astronomy, telling stories that feature characters learning about space in a way that appeals to, and is accessible by, young children. The comedy and music help kids learn a variety of physical science concepts, such as gravity, tides and moon phases. At the heart of every episode is a basic, kid-friendly question about outer space or Earth science. In the show, the characters often use a scientific method to find the answers to their questions. Each episode of READY JET GO! will include two 11-minute stories, as well as a live-action interstitial. The series also features both curriculum and character-driven original songs, sung by the entire cast, with topics ranging from a love duet between Mr. and Mrs. Propulsion to a description of our galaxy’s stars. 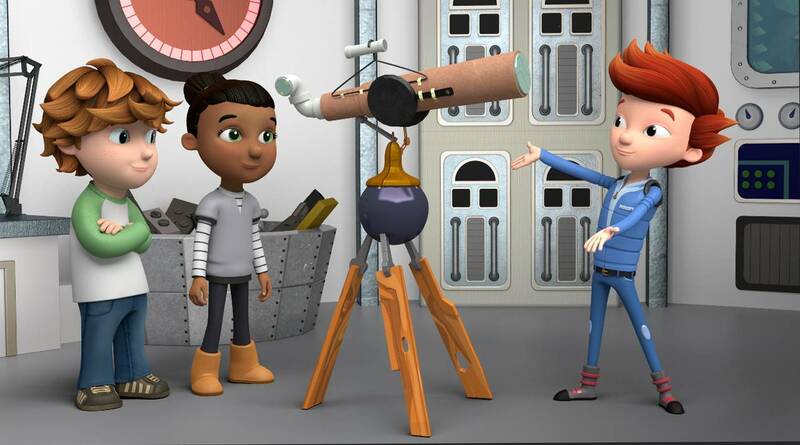 “Public media is a natural home for READY JET GO!, giving all children a free and safe place to explore science content,” said Debra Sanchez, Senior Vice President, Education and Children’s Content at the Corporation for Public Broadcasting. Created by Craig Bartlett, READY JET GO! is produced by Wind Dancer Films. PBS SoCaL is a station partner for the series. Major funding for the series is provided by the Corporation for Public Broadcasting (CPB).